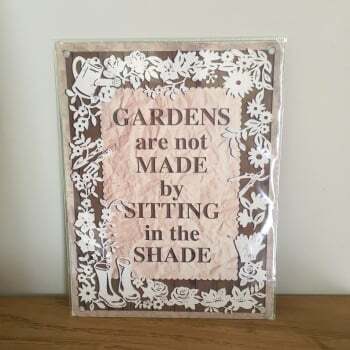 This small metal wall sign from Ruddick Garden Gifts reads " Gardens are not made by sitting in the shade" . It has a pretty intricate design around the edges and comes with 4 pre-drilled holes for hanging. This metal wall sign is already packaged so would make a great gift idea for anyone who loves their garden.